Procraftination: Happy! Seize The Birthday with some cluster stamping! Happy! Seize The Birthday with some cluster stamping! 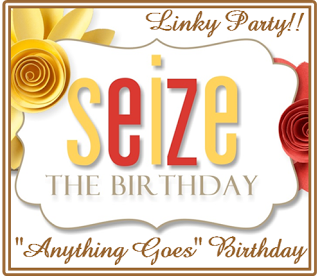 Yes, it's time for a new challenge at Seize The Birthday! Guess what? There is no Toppings option for this challenge. That means ANYTHING goes. Well, as long as it's a birthday card, of course! I used a technique called Cluster Stamped Sentiment. HERE is the link to the video, if you'd like to try it. Okay...follow the link HERE to see what my team mates have created to inspire you! I hope you'll play along with us! I love that cluster of stamped buttons Susie! Thanks for the link...going to check it out! Great card!